Today is Labor Day here in the States, and ordinarily that means I'd be introducing a reposting of last week's article for you to read while the web team is off having barbecues and enjoying what little sunshine we can get here in Seattle. The only thing standing between you and the priceless treasures of Zendikar is fellow planeswalker Nissa Revane. Granted, the world of Zendikar itself has done its best to kill you. A geopede bit clean through your leather climbing harness two miles up a sheer face of Mount Valakut, plunging you into a ravine—which fortunately bore water, but unfortunately also bore some rapids-loving breed of piranha. 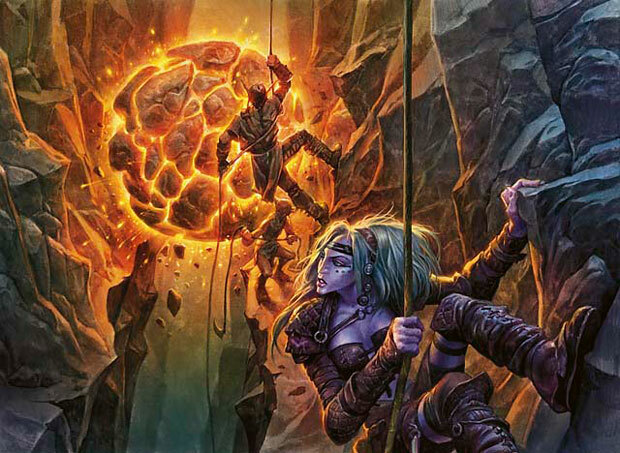 The same second you managed to get your hands on one of those strange stone hedrons in Turntimber, you crashed headlong into a crude earthen pit, facing a baloth who looked like it had just heard the dinner bell. You had almost arrived at the misty Jwar Isle, with your maps and guides intact, when the sea decided to take your journey personally, coalescing into an enormous, briny maw and swallowing your galleon whole, washing away all of your cargo and most of your resolve. And granted, it's not as if you've only been after the idols and the grails and the gemstone-studded catacombs that twinkle in the torchlight. Zendikar's mana itself is a treasure to any planeswalker. The land here crackles with magic—just the act of forming a mana bond with Zendikar's terrain causes a burst of magical pyrotechnics. 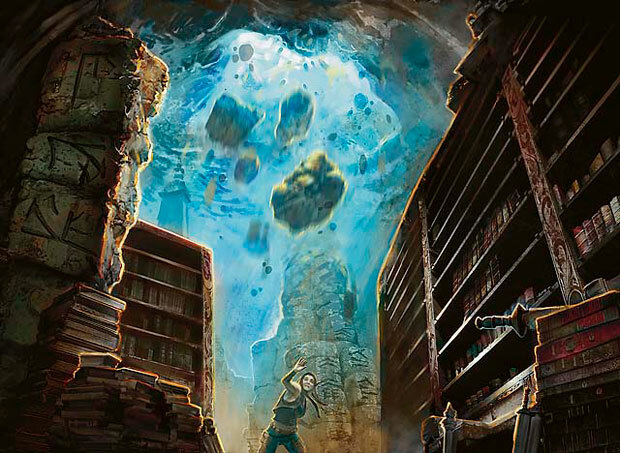 You're convinced that Zendikar isn't crawling with explorers and planeswalkers only because it's got a few trinkets buried in its ruins, desirable though those treasures may be. They're here because Zendikar itself is power. You're no tenderfoot, though; you didn't venture into the wilderness unprepared. 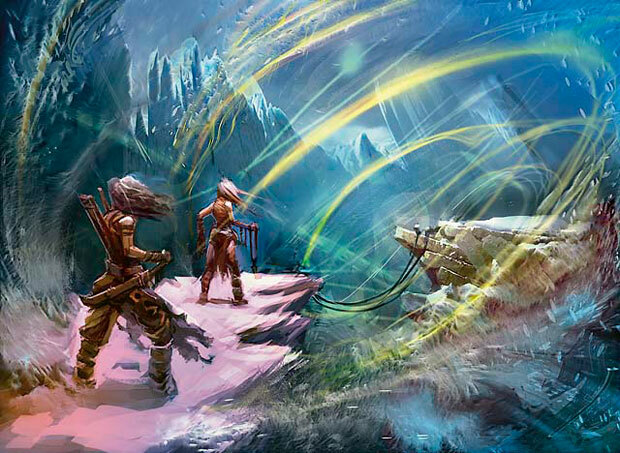 With a sheaf of recent expedition maps from a Sea Gate loremaster, an enchanted spyglass bought off the trappers at Greypelt, and a solid steel, kor-forged machete, you've managed to survive Zendikar's most obvious dangers. Of course, you've seen more than your fair share of trail guides perish under rolling balls of lava, snatched up by hungry-tentacled gomazoa, or shriveled up skin-to-bone by a fierce case of mire blight, but that's the open trail for you. You've got to keep your wits about you and focus on the big X on that atlas. But then there's Nissa. The plane clearly has an friend in that ubiquitous elf, whose warrior attendants show up at every turn, thwarting what anyone would agree is your harmless emancipation of just a few of Zendikar's resources. It's as if you're treading on her personal territory, no matter where on Zendikar you explore. Maybe she's native to this world. Maybe she's got a grudge. Did you break an elvish law or something? You've stayed out of her way so far. You trust your ability to judge a threat, and there's no questioning her power or her elves' devotion to her. But you get the feeling that if Zendikar's fickle sky-ruins or six-foot swamp mosquitoes or blood-scouting vampires don't do you in, it'll be her overbearing frame standing over you. At some point or other, it'll come down to you or her. So let's get to know her. Nissa Revane is a planeswalker, a Multiverse-traveling mage you can summon to your side to fight and cast her own repertoire of useful spells. Nissa has three abilities. Let's look at them one by one. Nissa's first ability lets her summon up one of her own personal guard of elite elf warriors. Nissa never goes anywhere without some attendants to protect her and to enforce the code of the forest—and you shouldn't build a Nissa deck without at least a few of Nissa's Chosen! Nissa's Chosen is a common in Zendikar, so it'll be easy to pick up a full set. It's very similar to Elvish Warrior, a 2/3 for an efficient GG, except that Nissa's Chosen returns to the bottom of your library when it dies. That allows Nissa to search out her warrior again, even after it falls in battle! 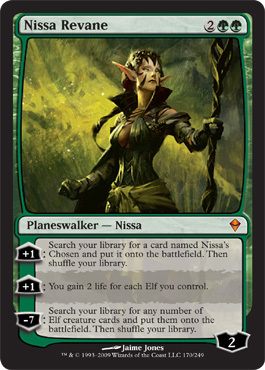 Nissa is one of the best planeswalkers at protecting herself, as she gains loyalty while surrounding herself with her doughty elvish enforcers. 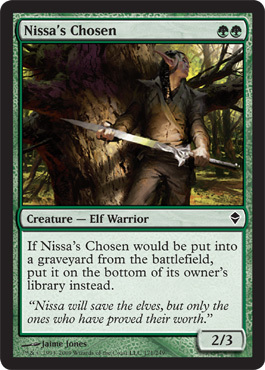 If one of the Chosen dies in the course of protecting Nissa from harm, have Nissa search up the warrior again on your next turn. Plus, as long as they stick around, you can build up a formidable retinue of Nissa's Chosen in no time—which leads right into her next ability. That ... is a lot of life. Many players remember Onslaught's insane Wellwisher, and this is twice as much life per activation—and again, this ability gains Nissa loyalty. Did we mention that Nissa summons her own Elves to count toward this number? Left to her own devices, she's an engine of creatures and life all unto herself—a very handy planeswalker to call to your cause. Nissa is definitely a leader of elves, ready to play the centerpiece of any dedicated Elf deck—or she can command a minor Elf subtheme in any green deck. 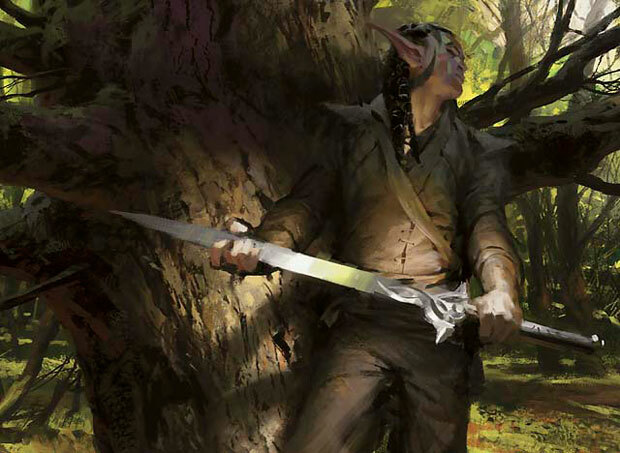 Zendikar is not a dedicated tribal set, but between Magic 2010 and Zendikar (and other recent sets, and other sets to come), there are plenty of Elves to build a deck focusing on the long-eared ones. Or you can just use Nissa's runaway double-Wellwisher ability on her own Chosen retinue. So, what about her ultimate? With those two "plus" abilities, she must be building up to something good, right? Yeah, I would characterize it as a "doozy." Nissa works perfectly well in a deck with only a smattering of Elves. 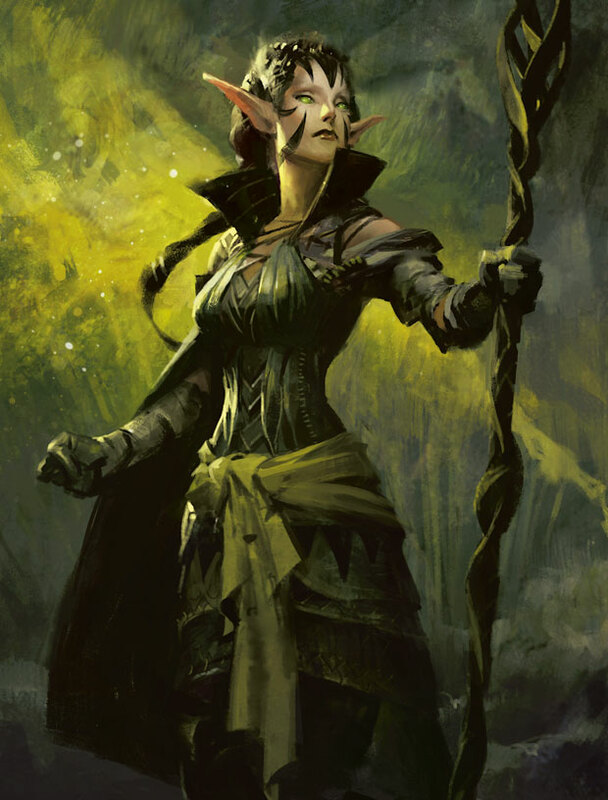 But if you did happen to have one or two or thirty other Elf cards in your Nissa deck, her final ability would be happy to mass-summon them all at once to complete your elvish legion. Look, you're a busy planeswalker; you've got things to do, foes to defeat—you can't be bothered to wait around drawing creatures and casting them with mana. Barbaric! Nissa can turbo-shortcut that process, plopping your entire Elf repertoire onto the battlefield with one mighty summons. Want to search out a few Elvish Visionary, to draw into your Overrun? Sure. Need a full set of four Llanowar Elves and four Elvish Archdruids, to get ridiculous amounts of green mana flowing? No sweat. Want to throw down a three-hundred-card deck's worth of Chameleon Colossus, Wellwishers, Priest of Titania, Imperious Perfects, Allosaurus Riders, Bloodbraid Elf, Deranged Hermits, Elvish Aberrations, Wilt-Leaf Lieges, Immaculate Magistrates, Mirror Entity, Viridian Zealots, and maybe a Gilt-Leaf Archdruid as the cherry on top, all in one turn? Go for it. I'm telling you. When Nissa speaks, elves listen. You've survived your encounters with the forces of Nissa Revane so far, but you wonder about her purposes. Her agenda would seem understandable—restore nature to the hands of its proper guardians, the elves—but not only is it in direct conflict with your own goals here, it's also a bit overreaching. 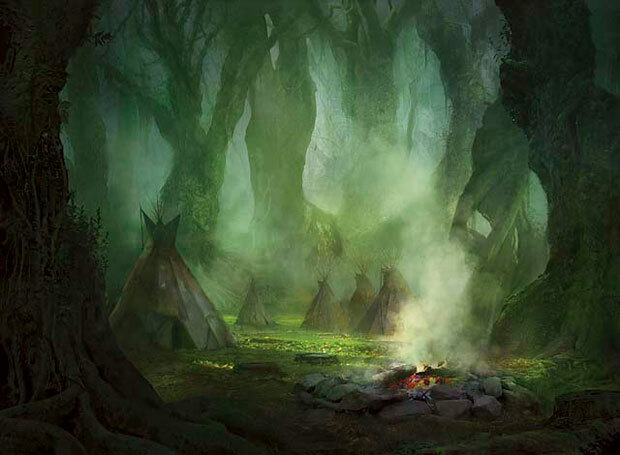 Certainly goblins, vampires, and even human offworlders like yourself tend to run roughshod over Zendikar, sullying and consuming the plane's unblemished wilderness in search of its mana-charged locales and buried treasures. And the elves exhibit admirable devotion to even the most humanoid-lethal areas of their world; fighting for the cause of nature on Zendikar is as thankless as fighting for dragons' rights on Jund. But all of the wilderness belonging to one people? Zendikar is almost all wilderness! You've ranged over nearly all of the plane's continents, and you've seen nothing that even resembles a large city to break up the landscape. There've been a few canvas-towns and cliff's-edge refuges, huddled scraps of civilization carved out from the wilds, and the ubiquitous stone ruins. But Zendikar has no master, at least not these days—not elves or anyone else. Zendikar is ruled only by the land. Perhaps that's your true reason for coming here. It's a chance to surround yourself with a world in its purest form, a world unspoiled by the whims of demigods and the short-sightedness of men. It's a chance to test yourself against nature's undiluted fury, its savage authenticity not tempered by millennia of cultivation and industry. 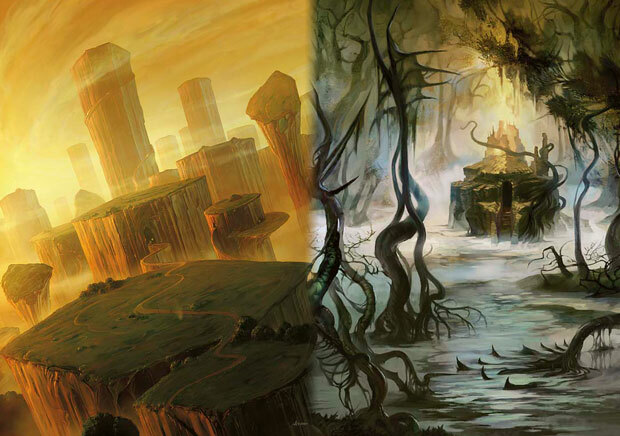 The simplicity is its beauty: it's just you, a machete, and the lethal landscape of Zendikar. Discovery awaits, and the stakes as clear as that bright line between life and death.